Hemp seeds are rich in Vitamin E antioxidants, minerals, microelements, protein, and linoleic acid. These nutrients and minerals, together with Omega 3 and 6, make this wonder oil great for health and beauty.I like using hemp oil at the ends of my hair to strengthen and moisturize strands to prevent breakage and split-ends. Hemp oil is rich in omega 6 and omega 3 fatty acids that make it a great natural emollient and non-greasy moisturizer. It mimics the skin lipids and energizes the skin’s protective layer. If you have tired, dry and dehydrated skin and nails, a few drops of hemp oil is a natural way to moisturize. It increases skin elasticity and water retention. Hemp oil helps heal psoriasis, eczema, rashes and other conditions due to its high fatty acid content. These fatty acids increase the immune responses in the body and aid in healing. They also improve skin oxygenation and hydration, preventing future occurrence of psoriasis and similar conditions. You can apply hemp oil for skin topically, but you can also supplement the treatment with soft gel capsules such as the Manitoba Harvest Hemp Oil Capsules. Studies reveal that consuming oil aids in improving blood levels of essential fatty acids and speeds up healing from within. Hemp oil also helps relieve itchiness and dryness from skin conditions for faster recovery. You might be thinking: how can an oil be good for acne-prone skin? Hemp seed oil is great for oily skin because of its light consistency and linoleic acid content. Studies show that people with acne-prone skin have a low percentage of linoleic acid. This fatty acid is known for its acne reduction, anti-inflammatory, and moisture retention benefits. If you’re doing the oil cleansing method to remove makeup, you might want to try hemp oil instead of coconut oil. 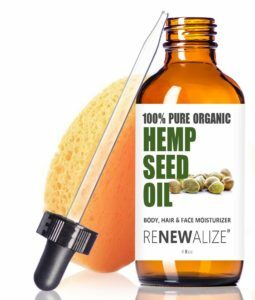 There are also hemp seed oil moisturizers such as the one from Renewalize that you can purchase online. Want to get the most benefits of hemp oil for hair and skin? Check out these recommended hemp oil products! Hemp oil can help you have a great complexion! It is easily absorbed by the skin, makes a great balancing moisturizer, and helps clean and detoxify the skin. This oil does not clog pores and will not leave a greasy residue. Because it is similar to the skin’s natural lipids, hemp seed oil is able to penetrate the epidermis and subdermal layers of your skin. Hemp oil is sometimes an ingredient in hair conditioners, but you can purchase raw hemp oil such as Nutiva Organic Hemp Oil and use it to treat dry hair. Massage a couple of drops of hemp oil in your scalp to improve blood circulation, moisturize the skin, and prevent dandruff. It can even thicken the hair texture and prevent hair loss. I like using hemp oil at the ends of my hair to strengthen and moisturize strands to prevent breakage and split-ends. 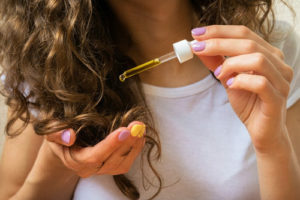 Loved reading about the benefits of hemp oil for skin and hair? Check out 10 Ways to Use Hemp Oil.